A few days ago, I put out a call for suggestions about what beer I should rate for my 150th review. Both wessthemess and beerstudio suggested Stone’s Vertical Epic Ale, of which I have a bottle of the most recent release — 11.11.11. While I do have something else in mind for my 150th review, I decided I would review this one since I was asked kindly. Escondido, California’s Stone Brewing Co. have released one of these Vertical Epic beers each year since 2002, and have plans to conclude the series this year. Each beer follows the same dating pattern — the first one released was put out on 02/02/2002, the second on 03/03/2003, and so on. The bottle up for review today was released this past November, the tenth volume. So what are Stone getting at with this series of beer? Well, these are big beers meant for aging, meaning you should put a bottle of this away and do a ‘vertical’ tasting of the beers a year after the last one is released. But that doesn’t mean you have to wait until 2013 to enjoy any of the beer…you can have them whenever you want, but know that Vertical Epic brews are built with aging in mind. But the really cool thing Stone is doing with these beers, in my opinion, is that they release a very, VERY detailed homebrew recipe for each Vertical Epic beer. So if you have the equipment and access to the ingredients, you can make your own version of each beer. I will direct you to the Stone Vertical Epic website, which I encourage you to visit after you read my review. The 2011 version of Vertical Epic is a Belgian-style Amber Ale, brewed with a Belgian yeast strain, cinnamon, and Anaheim chilies from New Mexico. Stone used Pale, Crystal, Munich, CaraBohemian, and Special B malts, while hopping with Warrior, Target, Perle, and Pacific Jade. 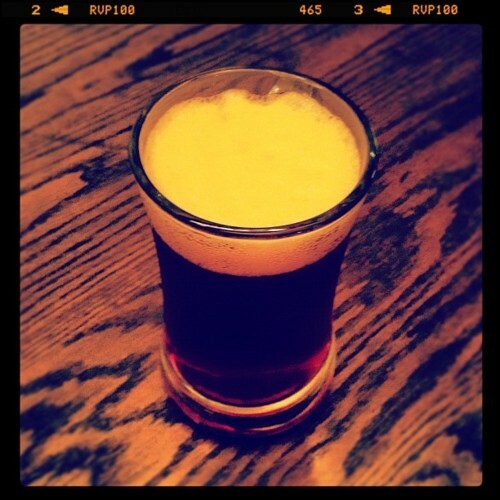 Pouring gave way to an average head that quickly diminished, creamy in texture, leaving a thin skim on top of the beer. The liquid itself was a beautiful deep amber-red color, clear of particles and sediment. This beer left no lacing behind as I sipped. The aromatics were more or less all about the yeast, imparting some nice smells of banana, bubblegum, and clove on the front end. Deeper, the cinnamon lurks, along with hints of the Anaheim chilies — both of these scents give a spiciness to the brew, and there’s some sweetness in there, too, with caramel malts and some toffee. Quite nice. On the taste, I immediately got a bell pepper-like flavor, which I happen to like; it wasn’t spicy, it was just earthy and brief, leading into a broader array of caramel, bubble gum, clove, and a hint of dark fruits. Contrary to other reviews, I got a fair bit of cinnamon in the middle of the sip, leading into a mildly bitter finish that does have just a small touch of spice heat on it, along with an alcohol warm (9.4% alcohol by volume here). The mouthfeel was creamy but drying, which did make you want to take another sip, but this is not a thirst quencher by any means. 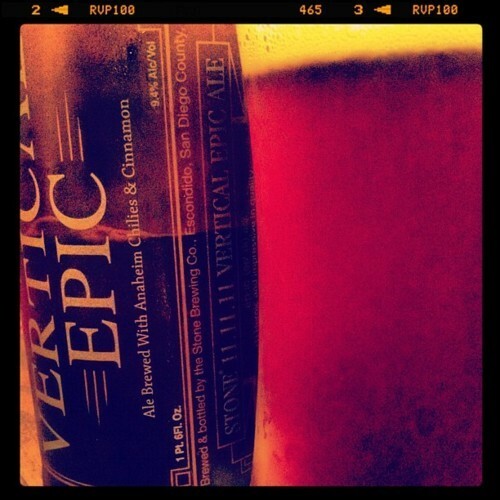 This Vertical Epic is definitely a sip and savor. Here’s the final verdict, from my humble perspective: I thought this beer to be good, but disappointing in terms of the hype. One of my personal favorite trends lately in the beer world is the experimentation with peppers/chilies, and I feel like the chilies used here just didn’t get enough play time. My suggestion would be up the spice and decrease the Belgian yeast flavors, but I only review, not make. Personally, I can’t see this one getting better with age (six months already on it), but you never know. If you see a bottle of this, grab it up… it’s good, but not the greatness you might expect. 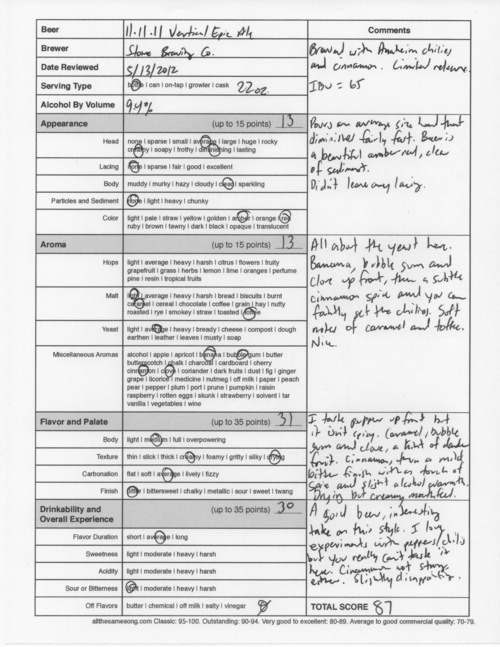 Stone 11.11.11 Vertical Epic Ale, 87 points. Price: $8.99 US for one 22 oz. bomber size bottle. 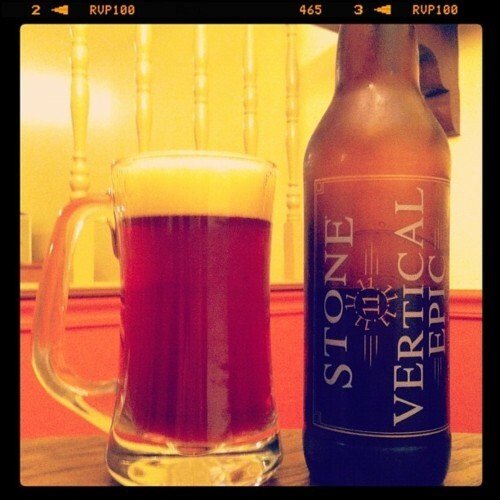 Tags: 11.11.11 vertical epic ale, 87 points, beer, beer review, stone brewing co.